ACLU Smart Justice Connecticut is grounded in the knowledge that the people closest to the problem are closest to the solution. We are an unprecedented cohort of leaders who have ourselves been directly impacted by Connecticut's justice system. We are formerly incarcerated people who are challenging mass incarceration by speaking truth to power, sharing our expertise, and building connections to each other and communities across the state. Together, we are campaigning to cut Connecticut's jail and prison population by 50% and to end racial disparities in our state's justice system. We are working to usher in a new era of justice, and we are not alone. We are part of the nationwide Campaign for Smart Justice, a multiyear effort in all 50 states. Since 1968, the Connecticut incarcerated population has increased by 334% to more than 13,000 people in jail and prison today, far outpacing population growth and crime. The racial disparities in Connecticut's prisons are among the worst in the country. Our state detains Black youth ten times more than white youth. Only five states are worse than Connecticut when it comes to disproportionately imprisoning Black adults, and only seven states are worse than Connecticut when it comes to disproportionately imprisoning Latino adults. Connecticut disproportionately sentences people of color to special parole, a highly restrictive form of state supervision that can set people up for perpetual punishment. As of early 2018, of the 2,569 people on special parole in Connecticut, 42% were Black and 31% were Hispanic, while only 27% were white. Connecticut budgets more money for its prison and jail system than for its public health department, DMV, anti-discrimination agency, and more. This money should be spent building up, not further harming, people who are incarcerated and their communities. Investment, not incarceration, is how we set people up for success and improve safety. 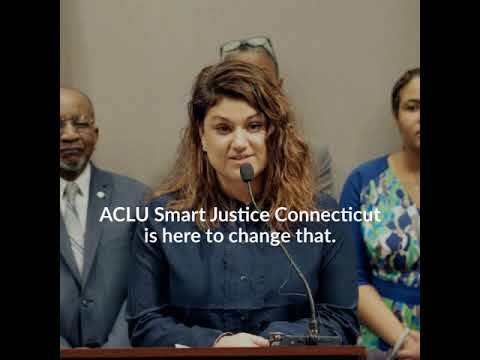 ACLU Smart Justice Connecticut is fighting in the legislature, the courts, and the streets to end mass incarceration. Extreme Sentencing: We must reduce both the number of people entering Connecticut's jails and prisons and the extreme laws and policies that drive extraordinarily long and harsh prison terms. Unfair Prosecutorial Practices: Prosecutors across the country work toward convictions, not justice. In Connecticut, these unelected officials, called state's attorneys, have no meaningful oversight. Broken Parole: Thousands of people in Connecticut -- including people who were convicted of violent and non-violent crimes -- are in prison for too long or cycle back into prison because of broken parole and release system. By expanding and improving evidence-based opportunities for release, we're working to ensure systems are fair, respect people's rights, and promote safety and success for people returning to their communities. Barriers to Reentry: Each year, 600,000 people nationwide return home from prison to their communities and families. Yet their challenges do not end once the prison bars are lifted. Formerly incarcerated people face nearly 50,000 federal, state, and local restrictions nationwide that make it difficult to reintegrate back into society. Among New England states, Connecticut has the highest rate of people who are disenfranchised because of their involvement with the justice system. We're working to end the collateral consequences that are imposed on people who are living with a criminal record. Discriminatory Police Practices: Police are gatekeepers to the criminal justice system, and abusive and biased police practices can fuel mass incarceration and racial disparities in the justice system. In Connecticut, police disproportionately pull over drivers of color and disproportionately tase Black and Latino men and boys. In Connecticut, police make initial decisions about how to charge people who are accused of crimes. We're working to create a world where police are accountable to the people they serve. Stand with us. Together, we can end mass incarceration and eliminate racial disparities in Connecticut's justice system. 1334% increase in Connecticut's incarcerated population since 1968, far outpacing population growth and crime. 2Only five states are worse than Connecticut when it comes to disproportionately imprisoning Black adults. 3Only seven states are worse than Connecticut when it comes to disproportionately imprisoning Latino adults. 4Connecticut budgets more money for its prison and jail system than for its public health department, DMV, anti-discrimination agency, and more.